Dr. Daniel E. Boone is a native of Southwest Missouri. While growing up in Springfield he attended Greenwood Laboratory School and the Southwest Missouri State University (Now Missouri State). In 1991 Dr.Boone graduated from Southern College of Optometry in Memphis Tn. He and his wife opened Nixa Family Eye Care in 1992 and Purchased Table Rock Family Vision Care in 2000. Dr. Boone and his wife Lynn, live on a small farm with their three children Daniel, Katie and Carter, their adopted twin grandsons Nathan and Ryan, and lots of pets. 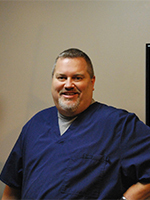 Dr. Boone enjoys hunting and other outdoor activities, and prefers to spend his summer hours with his family on Table Rock Lake. Dr. Boone and his Family are members of Ridgecrest Baptist church in Springfield, MO. While Dr. Boone enjoys the daily challenges of Primary Care Optometry, he has worked hard in developing a strong therapeutic practice treating eye injuries and eye infections, glaucoma, and dry eye. Dr. Boone loves the challenge of a complex contact lens fit and enjoys seeing patients of all ages. Dr. Dana E. Turner graduated from Drury University in Springfield with a bachelors in biology and chemistry. She then attended Northeastern State University College of Optometry in Tahlequah. During school, she gained much experience in diabetic and hypertensive retinopathy working at both HIS and Cherokee Nation clinics. She also completed an externship with the VA in Muskogee, Oklahoma. 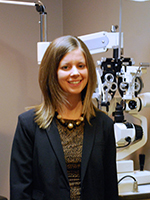 She graduated in 2005 and started practicing at Table Rock Family Vision Care and Nixa Family Eye Care. Her specialties include: comprehensive eye exams, contact lens fits, pre and post-operative surgical care, and management of ocular disease. She is a member of the American Optometric Association and the Missouri Optometric Association. She holds licensure in Missouri and Oklahoma. When not caring for patients, Dana is active in ministry with her husband, Tony, at North Bridge Church, where Tony serves as lead pastor. She also enjoys spending time with family and friends, long runs, and traveling.